While I’ve been whiling away time scrolling through Instagram make up artists and YouTubers, one product that has become quite a cult favorite caught my attention: A small glass bottle with a dropper that dispenses a beauty oil deemed as an elixir. Beauty gurus all over social media have been obsessing over this, so I thought I’d probe deeper and check what the buzz over rosehip oil is all about. Rosehip oil has a long list of amazing properties and a few drops of this goes a long way. It’s been proven to calm skin redness, reduce pigmentation, blur the appearance of fine lines and wrinkles, hydrate and improve skin elasticity and firmness, and give off a brighter, more radiant complexion. These properties make it perfect for those with dry, combination, mature, sensitive skin, and even those battling with post-acne scars. Think of it as a ‘liquid vitamin’ that heals and regenerates the skin from deep within. You just need to apply two-three drops on the face, neck, and décolletage after cleansing, in conjunction with your regular moisturiser. Rosehip oil is now easily available online. I’ve narrowed down a few brands here that you can check out and decide which one you wanna try! This one’s a combination of three precious seed oils known for their supreme revitalising and repairing properties on the skin: Black cumin seed oil from Egypt, known for its concentration in antioxidants. Rosehip seed oil from Chile, rich in repairing omega 3 and 6. And Camellia seed oil from China, naturally rich in nutritive oleic acid. Pure and organic, Natio Ageless Organic Rosehip Oil is all about providing a natural defense against the visible signs of ageing. Going beyond just organic, Juicy Chemistry extracts rosehip oil using the cold-pressed method. This means that no heat or chemical additives were used to extract the natural oil. This process does not alter or destroy the healing properties of the rosehip. Aura Cacia’s Rosehip Seed Skin Care Oil is completely organic and even includes a dose of Vitamin E.
This is one of those brands that have garnered multiple beauty awards and has been featured in numerous magazines. 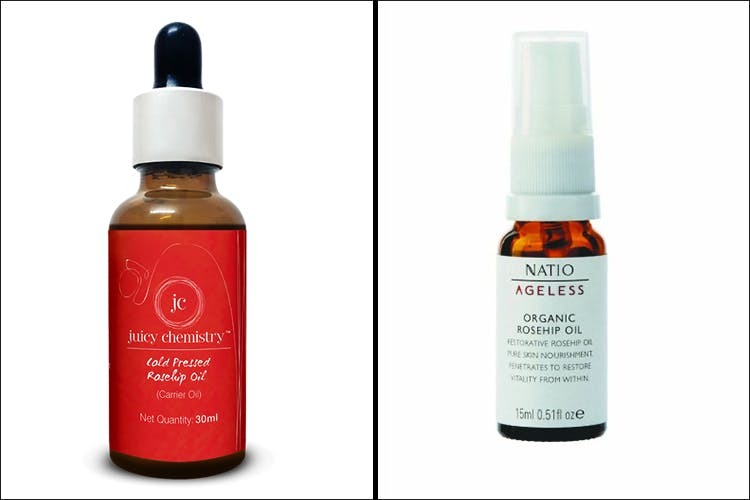 Celebs like Gwyneth Paltrow, Kate Middleton, Miranda Kerr and Victoria Beckham, all of whom have amazing skin swear by Rosehip Oil by Trilogy.